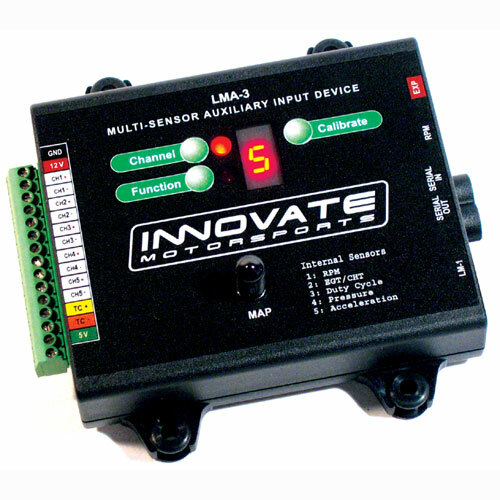 Innovate LMA-3: AuxBox (Multi-sensor Device). The AuxBox attaches to the auxiliary input of the LM-1 and allows a user to log and analyze 5 critical engine metrics in addition to the air/fuel ratio native on the LM-1. The AuxBox makes the LM-1 into a complete tuning kit, allowing the user to capture, view, and analyze data on all 6 channels that the LM-1 can log internally. Correlating AFR, RPM, MAP, and CHT, for example, is essential when tuning piggy-back fuel controllers, ECU programmers, aftermarket ECUs, or racing carburetors. The 5 internal sensors are intended for capturing Manifold Air Pressure (MAP or Boost), Cylinder Head Temperature (CHT) or Exhaust Gas Temperature (EGT), RPM conversion (from a tach signal or inductive clamp), Acceleration, and Injector Duty Cycle (or Dwell). The internal MAP sensor is a 3-bar absolute pressure sensor, providing accurate data up to 44.1 PSIA. The temperature measurement circuit features a K-type thermocouple. The internal accelerometer features 2 axis measurements for a variety of mounting options. Another key application of the AuxBox is road testing. Even a dyno doesn't provide as much real data as road testing. Factors like air flow, side force, and load vary significantly on a real road. With an AuxBox, a user can log 6 channels, in multiple sessions, for up to 44 minutes. Then, back at the garage, simply connect the LM-1 to you PC and view all of you log data. Use LogWorks to view fuel mapping, perform statistical analysis, overlay graphs, and playback a log on the virtual gauges. You can also view realtime data on LogWorks' gauges if you want to take your laptop on the road. The AuxBox also includes 5 external inputs for connecting external sensors in lieu of the internal sensors. This allows users to log data from external sensors like TPS or suspension data. The AuxBox ships with mounting hardware, a 6' thermocouple wire, the LM-1 connecting cable, and the user manual.